As I hold a silvery metal wire in the steaming hot water, drops of liquid metal form and fall into a shining puddle at the bottom of the glass. What was a thick solid wire is now a pool of molten metal. No soldering irons, no flames or torches, just a cup of hot water. 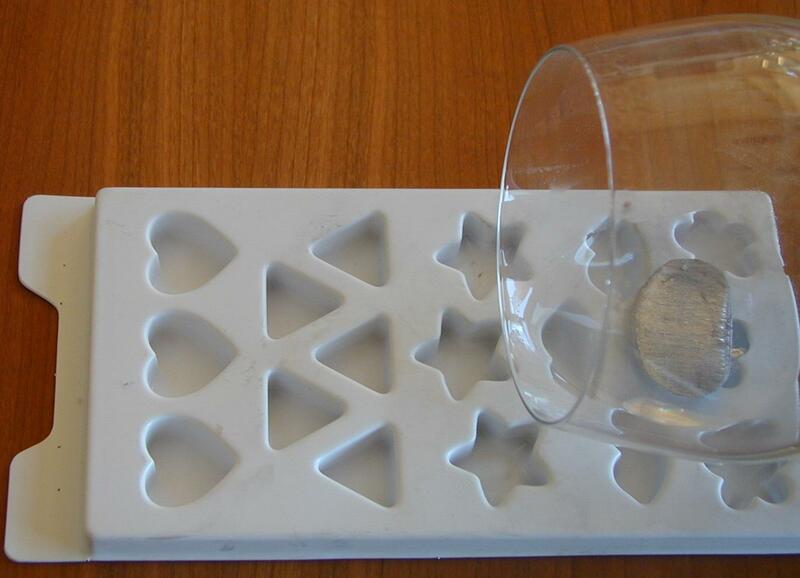 Since the liquid metal is only 144° Fahrenheit (62° Celsius), we can pour it into plastic molds designed for making candles or soap. In the picture below, about a foot of the wire sits next to a ruler. The wire comes in a thick vinyl tube, so it looks bigger in the picture than its actual 1/8 of an inch thickness. A few inches were melted and poured into the plastic mold. 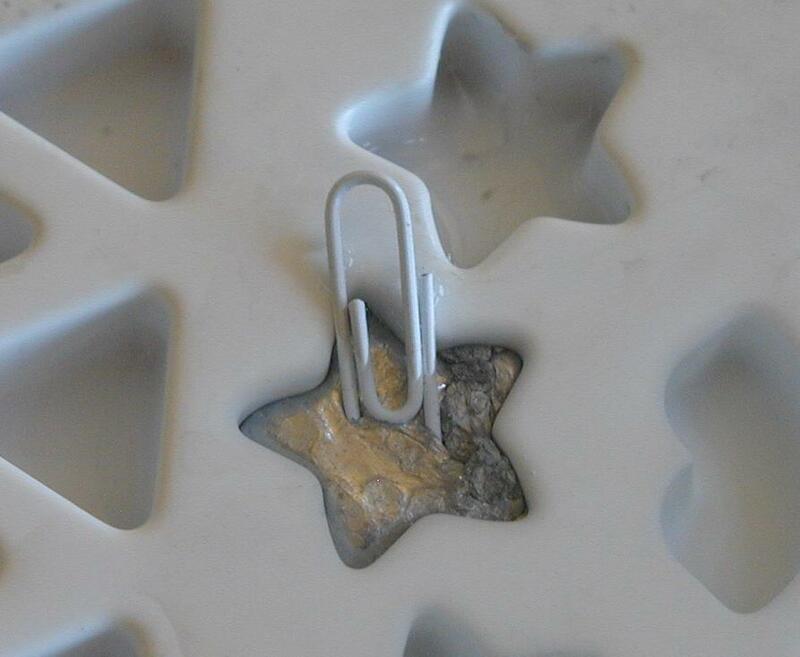 A white plastic coated paper clip was inserted into the mold before the metal solidified, just for fun. The metal is very good at filling all the nooks and corners in a mold, to faithfully reproduce items as fine as fingerprints. Below are some of the items we cast in metal, using only hot water. The metal is a mixture of bismuth, tin, and indium. We call it Field's Metal. Indium is a metal that looks like silver, but is about twice as expensive. It has special uses in scientific apparatus due to its interesting properties, such as its ability to stick to glass. This allows you to "solder" things directly onto glass, and to make a good metal-to-glass seal for vacuum work. There are many alloys that melt at low temperatures. These are calledfusible alloys. You may have heard of a famous one, called Wood's Metal. Wood's metal is a mixture of 50% bismuth, 25% lead, 12.5% tin, and 12.5% cadmium. It melts at a temperature of 158° Fahrenheit (70° Celsius). Cadmium and lead are toxic metals. By using non-toxic metals like indium, tin, and bismuth, Field's metal is safe to use as a toy. It melts at a lower temperature as well. Indium is not a household material, and can be hard to find. Commercial suppliers usually have minimum orders in the range of ten pounds or more, bringing the minimum cost to several hundreds of dollars. For that reason, we have made up a batch of Field's Metal and cast it into wires, and made it available to experimenters in our catalog in affordable quantities. Fusible alloys are used in some fairly common items. They are used in fire sprinkler systems in office buildings, where the metal melts if the temperature gets too high, and lets the water spray out. They are also used in the pop-up timers in turkeys. A bit of solid metal holds a plastic flag down against a spring. When the temperature is just right, the metal melts, and the spring pops the flag up into view. The melting point of an alloy is often quite different from the melting points of the pure metals from which it is made. Bismuth melts at 519.8° F (271.3° C). Tin melts at 447.8° F (231.8° C). 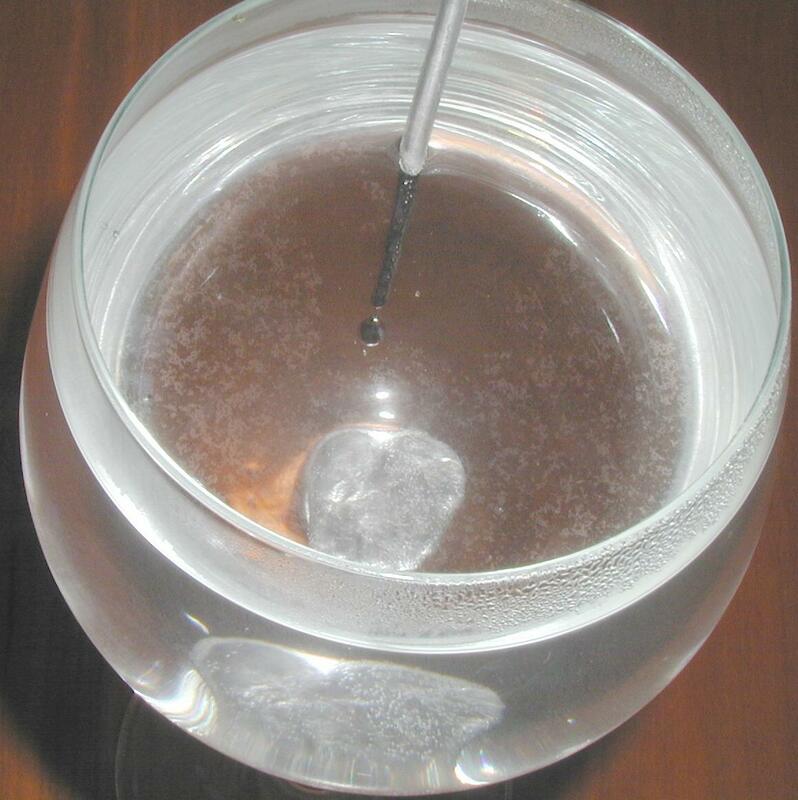 Lead melts at 620.6° F (327.5° C). Indium melts at 312.8° F (156.6° C). Pure substances have a sharp melting point. A pure substance is either an element, or a chemical compound. Mixtures melt over a range of temperatures. A eutectic alloy is one that has a sharp melting point. This implies that it is a chemical compound, where the elements are bound together in strict proportions, rather than a simple mixture of elements. In a mixture of elements, some of them will react together to make compounds. Compounds consist of exact proportions of one atom to another, such as one to one, two to one, three to two, etc. Any excess of one element over another will not react, and will stay in the mixture as a pure element. That is why mixures have a wider melting point. One chemical melts at one temperature, and the others melt at higher temperatures. Only when all of them have melted do you get a true liquid. What makes a substance melt at a given temperature is how strongly the molecules of the material bind to one another. Sometimes two elements combine to form a compound that binds tightly to itself. This would raise the melting point. Other times, the compound formed does not bind to itself as easily as the pure elements do. This compound would have a lower melting point than either of the pure elements. Compounds are not limited to two elements. Sometimes many elements bind together into a single compound. In electronics, one of the prefered solders used is a eutectic mix of lead and tin. By weight, there is just about 63% tin, and 37% lead. It melts at 361° Fahrenheit (183° Celsius). The atomic weight of lead is 207.2. The atomic weight of tin is 118.71. Thus the chemical formula for the compound is PbSn3. An easy fusible alloy can be made from bismuth, lead, and tin. Lead is toxic, so this alloy should be handled with care, and should not be used near food, and should not be considered a toy. For toy purposes, use Field's Metal instead. Bismuth can be found at sporting goods stores in the form of shot for use in shotguns. It is preferred to lead shot because it is not toxic, and doesn't pollute the water where duck hunters shoot. Because some of our readers were having a hard time finding bismuth, (especially outside of the United States), we supply it in our catalog. Lead and tin are not hard to find separately, but they are particularly easy to find together, in the form of solder. For our purposes, we will be using a slightly less common form of solder. Solder is usually made in the eutectic proportions, or in the nearly eutectic form of 60% tin, 40% lead. But some solder is available in the opposite ratio -- 60% lead, and 40% tin. This is the form we need (unless you can obtain your lead and tin as separate items). The eutectic form of the bismuth-lead-tin alloy is 52.53% bismuth, 32.55% lead, and 14.92% tin, by weight. The compound is Bi8Pb5Sn4. If you have the separate metals, you can weigh them out and melt them together, and you will have an alloy that melts at 203° Fahrenheit (95° Celsius). If you have the 40/60 tin/lead solder, you can weigh out equal parts of the solder and the bismuth, and melt them together. This gives you a mixture that is not eutectic, so the melting point is a range from 203° F (95° C) to 219° F (103.8° C). This will still melt in near boiling water.